*High precision spindle accommodates collet chucks and 3-jaw chucks. *C-axis functionality on spindle allows for milling, drilling, and tapping. *High/low pressure coolant pump for fine surface finishing and deep hole drilling. 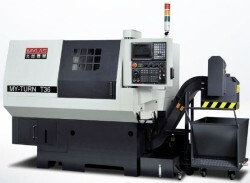 *Extra large 340mm travel on X-axis for excellent machining capabilities. *Oversized box ways on X and Z-axis for maximum stability. *Syntec PC-based, Fanuc, or Mitsubishi controllers are available. *Combined with C-axis functionality, Y-axis is capable of performing end milling, drilling, and tapping operations. Especially suitable for small and complex parts production. *By working with live tools, the face milling function can also drill eccentric holes or taps, saving on secondary workpiece set-up time.